For the second time in five days off Southern California, a trained disentanglement crew is attempting to free a gray whale caught in commercial fishing gear. The latest is a sub-adult traveling with a larger whale. They were spotted swimming slowly to the north Wednesday afternoon off Newport Beach, by a U.S. Coast Guard helicopter crew, which noted that a line attached to a buoy was wrapped around the smaller whale's fluke. Part of the same disentanglement group that freed a juvenile gray whale from a gill-net Saturday off Dana Point arrived alongside both whales before dusk Wednesday, but conditions were too rough to attempt to cut what looked like several wraps of polypropalene line (perhaps from a lobster trap) around the whale's tail section, or base of its fluke. For Dave Anderson, the leader of both rescue attempts, it has been an exhausting and emotional five days. The juvenile gray whale his team freed from a massive gill-net after a marathon effort on Saturday might be the same whale that was found dead in Long Beach Harbor on Tuesday afternoon. Both were thin and had similar wounds to the tail section, and the dead whale was trailing a short strip of black rope similar to the strip rescuers were unable to cut loose. The match is not yet certain, however, but Anderson said that either way the publicity of these events helps to put the spotlight on the perils gill-nets and other indiscriminate fishing gear represent to migrating whales and other marine mammals. "The good news is that because of the story, so many people now know that millions of dolphins and whales are killed by this type of fishing gear," he said. "So the whale's life will not have been for nothing." Anderson runs Capt. 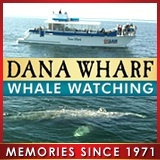 Dave's Dolphin and Whale Safari and is hoping to return to whale watching, instead of whale rescuing, as soon as possible. I jumped at the chance to send a letter, but I also feel those who fish for there living, has the right to do so also. I thnk what happens is the nets are lost, most likely from an whale being tangled in it, which is wrong for the GillNet Fishery;s to not be accountable for the safety of endangered Ocean wildlife. My suggestions I added to the letter was to create a law which the nets must have a serial number given to each one, and then a registration number assigned to each net. If a net was left out and not check to see if any wildlife was entangled, and ( Example ) it was found wrapped around a whale, the Fishery who owes it would be fined, imposing a heavy fine. The nets are regulated and checked making sure the Fisherys are keeping a better patrol of them. If the Fisherys lost a net it needs to be reported. There must be a way for all involved to at least take into consideration whats at stake here, our Ocean Wildlife. I appreciate it if you can help get the word out!